The ACLU filed a lawsuit against Detroit's 36th District Court. 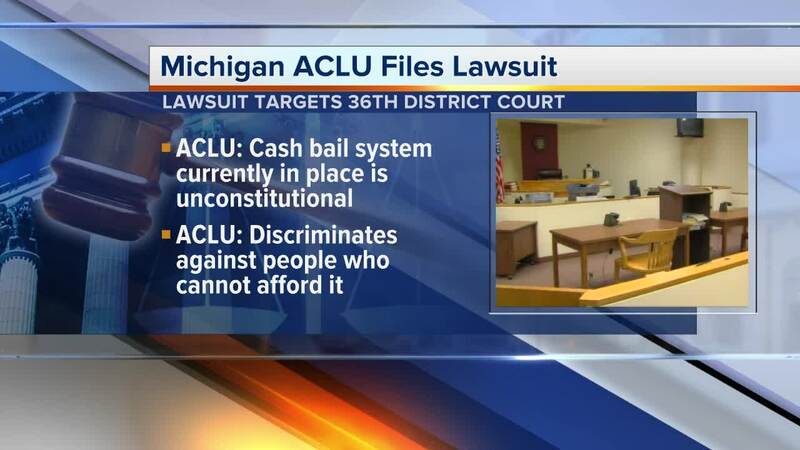 The ACLU of Michigan filed a lawsuit against Detroit's 36th District Court for issuing high bail for those who cannot afford to pay. The 66-page lawsuit states, the cash bail system currently in place is unconstitutional and discriminates against people who cannot afford it. According to the lawsuit, the 36th District Court is violating the constitutional right of people who are presumed innocent when they are placed in jail because they cannot afford bail, stating that some are denied access to an attorney while others walk free on the same charges because they have money. The lawsuit was filed on behalf of seven plaintiffs. The 36th District Court's chief judge and five magistrates, as well as the Wayne County Sheriff, were named in the lawsuit. In the lawsuit, the ACLU states that Michgian's court rules mandate meaningful inquiry into an arrested person's ability to pay bail, and require pretrial release without cash bail except in extraordinary circumstances. Additionally, the state also requires that counsel be appointed to represent defendants at arraignment. The ACLU says the requirements are violated in the 36th District Court, where arraignments last a few minutes, defendants appear without cancel and 85 percent of those who are arraigned while under arrest are required to pay cash bail in order to be released. The Court does not comment on pending litigation when the Court is a named party.